Trucking company registration. Use the loadboard and trucking tools. 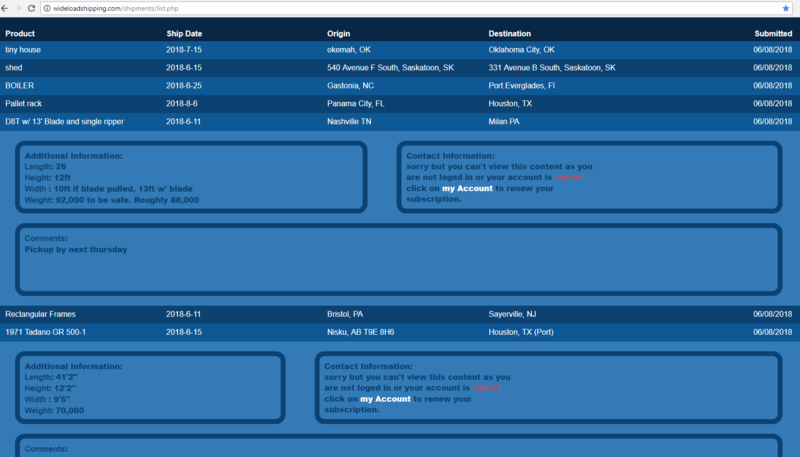 Trucking company registration page. Meet customers that need their oversize and heavy haul equipment and machinery moved. We deliver direct customer freight and broker posted freight right to your desktop or mobile device live in real-time. You can’t get the job if you don’t know about it. We’re not a reverse auction cheap bid site. We’re an open marketplace with customers looking for qualified carriers they can develop working relationships with.We solved that problem. Our website is entirely dedicated to and focused on feeding your trucking company direct customer leads every day of the week. Our primary focus is connecting heavy haul and oversize trucking companies up direct with the customer. So instead of your sales team trying to find new customers by marketing blindly to millions of companies that may or may not be moving anything at all – we give you live shippers that are planning projects right now.Our customers are searching for you.For over 14 years we’ve been providing sales teams for heavy haul and oversize trucking companies with new customers, tools and resources that create opportunity for growth. Our loadboard and directory are easy to use and give your company the competitive marketing edge to develop new customers. Get connected with direct shippers and brokers without giving up a dime. We take 0% of your line haul. You invoice the customers direct. Negotiate a industry fair rate that is based on your companies needs. Name your own payment terms for shipments you haul – COD is standard on many. Simple to use load board that is SUPER EASY to monitor. Get email notifications when new shipments are posted. No shipments on our load board are ever over 30 days old. International freight as well as NASA, DOD, military, drilling, private and much more. Meet quality customers that are serious about the equipment & machinery they need shipped. Gain access to freight that is posted nowhere else. Phone app for iPhone and Android phones. Use our system FREE for 5 days. If you don’t like it, leave it. Affordable pricing as low as $33.33 per month (paid yearly) – easily pays for itself. FREE – locate pilot cars live in real time with our PiloTrac system. FREE – oversize and over-weight trucking regulations for all of North America. FREE – explore our HUGE site. We’re jam packed with all kinds of shipping tools and information. You can set your account to notify you of every shipment posted to our system. You will know exactly what is being posted in real time. The very second a customer submits their shipment to our system it is posted live in real time. Our notification system will then notify you that a new load has been posted. You call the customer: Our load-board system. We prefer to call it a “leadboard”. Since heavy haul and oversize freight requires planning, permits, pilot cars and sometimes even more, our system is NOT designed as a get loaded quick service. If your looking for a quick “book-n-hook” load-board you are in the wrong place. If you are looking for a place to meet and develop long term relationships with direct customers that come to the site looking for carriers then this is the right place. Put your sales team to work with real-time leads of people shipping right now. Meet customers that keep your company busy and profitable – for as low as $33 bucks a month when purchased yearly. The customer calls you: Our carrier directory is AWESOME! Many trucking company directories for the most part, stink. Why? They don’t generate any business. You plug in your info and nothing happens. That’s lame. Our directory rocks! Why? What makes it different? We’ve been running the same directory software for the pilot car industry for 10 years. We’ve got it down to a science as far as search engines go so customers actually call you. Your directory listing will out perform your own website if you give it more information than “we run all lower 48”. Remember these are computers and they can only go off of what you give them. Give a little and get a little. Give a lot and… Customers are here searching for trucks. Get listed. You list, your phone rings more, simple. A basic package is less than $6 bucks a month! Directory registration.